Industrial Clear Eastar basket strainers are used when the process flow can be interrupted to clean the strainer basket. 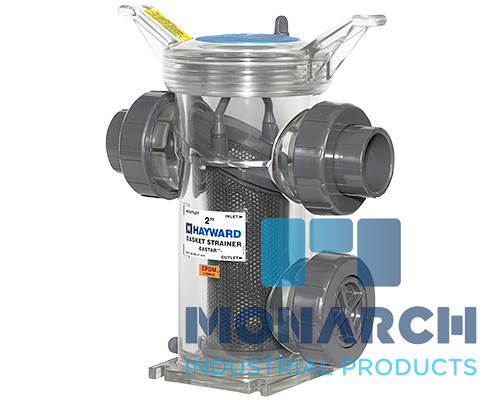 The Hayward design has many user-friendly features and requires no tools to safely access the strainer basket chamber. The oversized handles on the basket chamber cover minimize the effort required for opening and closing the basket chambers. The tab style vent and drain ports have a capture o-ring design and thus do not require tools to remove. The true union connections simplify installation and, specifically for glued socket connections, enable installation/removal without cutting the pipeline. 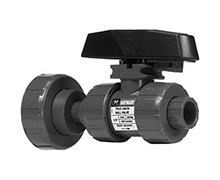 1/2", 3/4", 1", 1-1/4", 1-1/2", 2", 3", 4"
SB Strainer Brochure: 1/2" to 4"
SB Strainer Brochure: 6" & 8"
To assist us in providing a quotation or recommendation, please provide as much detail of your application as possible. Please provide detailed contact information. Please provide details of any special requirements, lead times, certification or documentation etc. "Liquid Filtration Equipment, Bag Filters, Filter Bags and Manufacturing Strainer Screens for Australia, Pacific and South East Asia for over 25 years"